Top end power, gigantic engine, strong B-King styling features, unmatched handling and control are the new-found words of New Hayabusa GSX1300R. Explore the review to get the features, technical specifications & price. 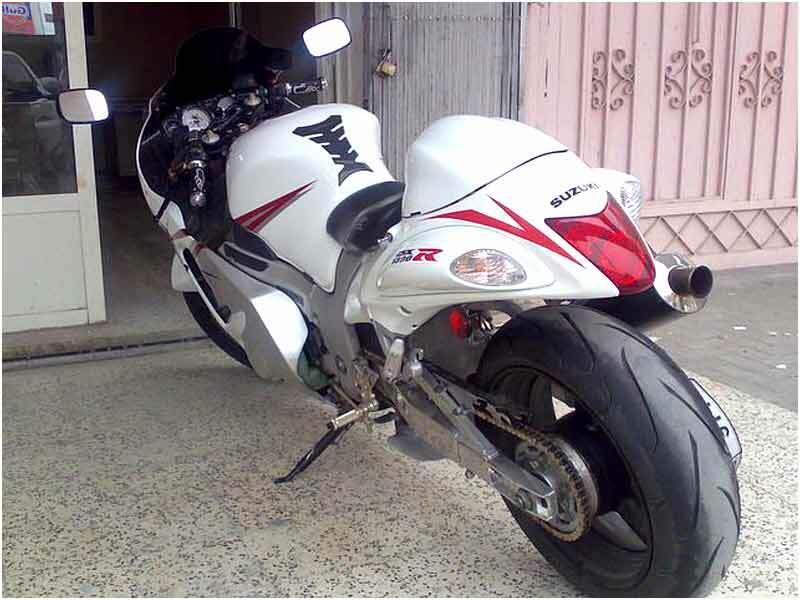 Celebrated as the fastest motorcycles, the Suzuki Hayabusa GSX1300R is a top end performance bike capable of reaching speeds in excess of 190 mph winning its reputation as a power house. The New Suzuki Hayabusa is an extremely popular motorcycle within the community of sports bike possessing the top end power for straight line performance and it corners superbly well despite the weight and the overall length. 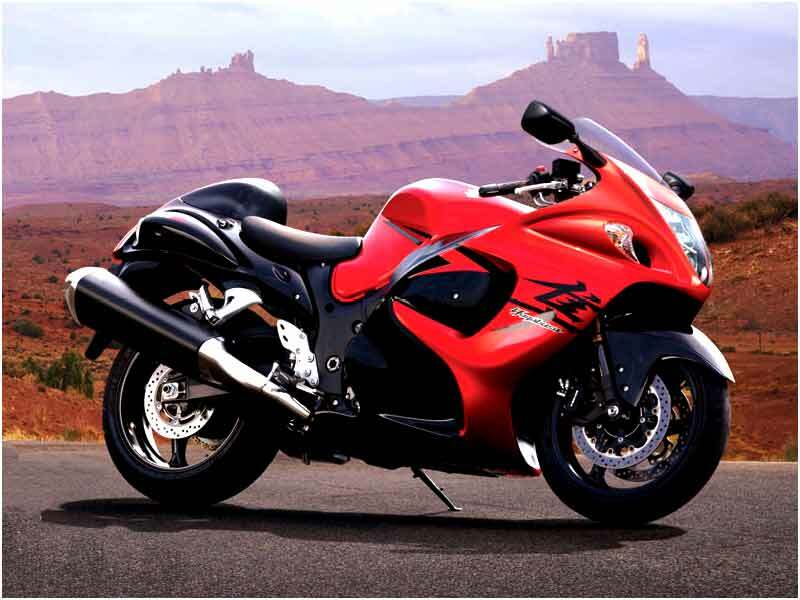 The 2009 Hayabusa 1300R features a twin-spar cast aluminum alloy frame to generate optimum strength, balance and superb handling. The swingarm is constructed from three cast aluminum sections and the reduced welds providing a clean look. Inverted front forks are fully adjustable for compression, rebound damping and spring preload. A standard steering damper provides maximum stability. The rear shock absorber features three-way adjustability defining excellent damping characteristics. The 2009 Suzuki Hayabusa GSX1300R runs on a 1340cc, 194HP + DOHC liquid-cooled engine with 16-valves, twin swirl combustion chambers, and gear-driven counter balance for smooth operation. The gigantic engine is powered by Suzuki's SDTV fuel injection system with dual injectors, and a ram air intake boasting a large volume air-box. Suzuki's S-DMS (Suzuki Drive Mode Selector) allows the rider to choose from three different engine settings depending on riding conditions or rider preferences. In 2009 Suzuki loaded the Hayabusa with a powerful 32 bit ECU, boasting 1024 ROM for increased performance and to support new functions like S-DMS. Also new to 2009 Hayabusa, it gained a lightweight titanium intake and exhaust valves. The new narrow 14 degree valve angle is designed for high combustion chamber efficiency. A high efficiency radiator now features dual electric fans for increased cooling capacity. The oil cooler now boats ten rows cores for increased heat dissipation. The New 2009 Hayabusa is equipped with radial mounted front brake calipers, a lightweight single piston rear brake caliper in conjunction with a 260mm rear disc. Additionally, the Hayabusa features an aggressive three spoke wheel design including a massive 200mm rear tire. Stylish instrument cluster features the signature strong B-King styling with an analog tachometer, digital speedometer, fuel gauge, water temperature gauge, twin tripmeters, clock, maintenance interval, running time, average speed, gear position indicator, and S-DMS mode indicator. Twin-spar cast aluminum alloy frame features optimum rigidity balance and superb handling. Beautiful cast aluminum alloy swingarm for the B-King style is constructed of 3 main sections for minimal welding lines and a clean overall look. It sports a unique three piece front fender design for a high quality look with the aggressive look. It is also available with Anti-Lock Braking System (ABS) for optimum braking performance. New Hayabusa GSX1300R 2009 edition employs fully adjustable inverted front fork featuring DLC coated inner tubes for minimal friction resistance and outstanding suspension performance over a variety of riding conditions. It has again the rear shock absorber with a 43mm piston and 14mm rod diameter which works excellently. The lightweight and rigid twin-spar aluminium frame minimizes weight while maintaining high torsional strength. Newly bridged aluminium alloy swingarm features a new cross-sectional shape for increased rigidity and to cope with improved rear tire grip and increased engine output. It also sports new radial-mount front brake callipers for the maximum braking performance and help smaller 310mm front brake rotors reduce unsprung weight. Lightweight single piston rear brake caliper works in conjunction with a new larger 260mm rear brake disc. The newly designed wheels mounted with high performance Bridgestone BT-015 tires gives unmatched handling and control. Passenger seat and rear sub-frame are lowered for improved passenger comfort. Fuel tank height is lowered to allow riders helmet to tuck in and windscreen height is increased for improved wind protection and optimum aerodynamic efficiency with the rider in place. Newly designed vertically stacked twin headlights provide increased light intensity, improved light distribution and match the elegant flow of the New Hayabusa styling. LED taillight utilizes a double lens structure with a clear inner lens and a red outer lens for maximum visibility and a high quality finish. 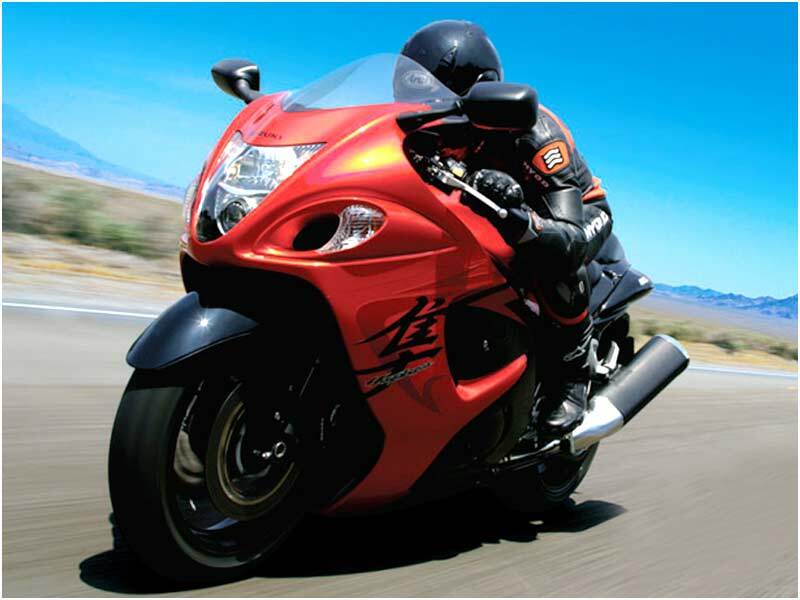 Titled as the fastest bike in the world, Hayabusa GSX1300R gives a mileage ranging at 4-6 kmpl.